A “real variety show,” hosts Yoo Jae Suk, Park Myung Soo, Jung Jun Ha, Ha Ha, Noh Hong Chul, Jung Hyung Don, and Gil Seong Joon undergo several challenges every week. From arriving early on set to composing original songs, the hosts scramble their way to the top and win, proving that Infinity Challenge is 3-D: dirty, dangerous, and difficult. Let the games begin! Apparently, the show’s format allows for celebrity interlopers as well. Clad in a bright blue tracksuit and red-and-white-striped knee socks, Black is more than willing to participate in the Infinity Challenge shenanigans, a gauntlet that includes stuffing his mouth with as many marshmallows as humanly possible. He aces that one, easily besting his small-mouthed challenger. How about an extreme pillow fight? Black can handle that, too, though the competition seems to take a toll on his body and mind. 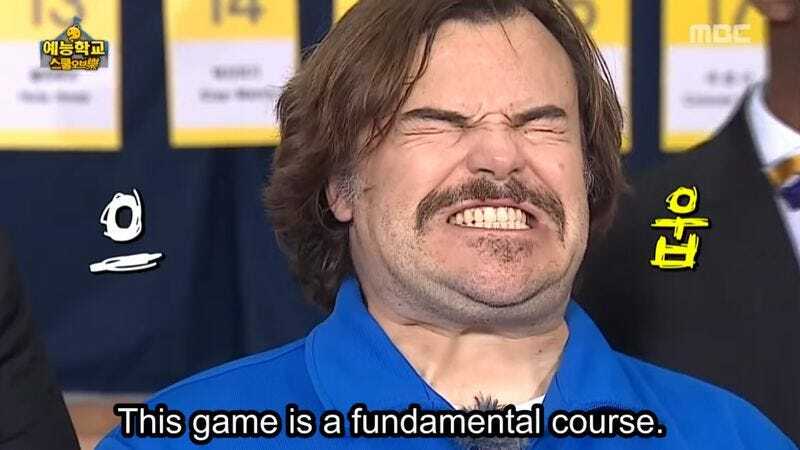 And then, there is the video DramaFever describes as “the crème of the crop, Jack Black singing popular K-pop tunes while the hosts guess what hit he is impersonating.” Here, Black listens to some local hits through headphones and then attempts his own a cappella renditions. The Tenacious D singer does not hold back during this round, really throwing himself into his deranged performance.